He received many honors and awards for his music, including a Kennedy Center Honor (2010), a Grammy Lifetime Achievement Award (2006), a BMI Icon Award (2006), and induction into the Nashville Songwriters Hall of Fame (1977), Country Music Hall of Fame (1994) and Oklahoma Music Hall of Fame (1997). He died on April 6, 2016 — his 79th birthday — at his ranch in Shasta County, California, having recently suffered from double pneumonia. 3 "Okie from Muskogee" and "The Fightin' Side of Me"
Haggard's parents, Flossie Mae (née Harp) and James Francis Haggard. The family moved to California from their home in Checotah, Oklahoma, during the Great Depression, after their barn burned in 1934. They settled with their two elder children, Lowell and Lillian, in an apartment in Bakersfield, while James started working for the Santa Fe Railroad. A woman who owned a boxcar placed in Oildale, a nearby town, asked Haggard's father about the possibility of converting it into a house. He remodeled the boxcar, and soon after moved in, also purchasing the lot, where Merle Ronald Haggard was born on April 6, 1937. The property was eventually expanded by building a bathroom, a second bedroom, a kitchen, and a breakfast nook in the adjacent lot. When he returned the same year, he and his friend were arrested for robbery. Haggard and Teague were released when the real robbers were found. Haggard was later sent to the juvenile detention center, from which he and his friend escaped again to Modesto, California. He worked a series of laborer jobs, including driving a potato truck, being a short order cook, a hay pitcher, and an oil well shooter. His debut performance was with Teague in a Modesto bar named "Fun Center", for which he was paid US$5 and given free beer. He returned to Bakersfield in 1951, and was again arrested for truancy and petty larceny and sent to a juvenile detention center. After another escape, he was sent to the Preston School of Industry, a high-security installation. He was released 15 months later, but was sent back after beating a local boy during a burglary attempt. After Haggard's release, he and Teague saw Lefty Frizzell in concert. After hearing Haggard sing along to his songs backstage, Frizzell refused to sing unless Haggard was allowed to sing first. He sang songs that were well received by the audience. Because of this positive reception, Haggard decided to pursue a career in music. While working as a farmhand or in oil fields, he played in nightclubs. Upon his release from San Quentin in 1960, Haggard started digging ditches for his brother's electrical contracting company. Soon, he was performing again, and later began recording with Tally Records. The Bakersfield sound was developing in the area as a reaction against the overproduced Nashville sound. Haggard's first record for Tally was "Singing My Heart Out" backed by "Skid Row"; it was not a success, and only 200 copies were pressed. In 1962, Haggard wound up performing at a Wynn Stewart show in Las Vegas and heard Wynn's "Sing a Sad Song." He asked for permission to record it, and the resulting single was a national hit in 1964. The following year, he had his first national top-10 record with "(My Friends Are Gonna Be) Strangers," written by Liz Anderson, mother of country singer Lynn Anderson, and his career was off and running. Haggard recalls having been talked into visiting Anderson—a woman he did not know—at her house to hear her sing some songs she had written. "If there was anything I didn't wanna do, it was sit around some danged woman's house and listen to her cute little songs. But I went anyway. She was a pleasant enough lady, pretty, with a nice smile, but I was all set to be bored to death, even more so when she got out a whole bunch of songs and went over to an old pump organ.... There they were. My God, one hit right after another. There must have been four or five number one songs there...."
In 1967, Haggard recorded "I'm a Lonesome Fugitive" with The Strangers, also written by Liz Anderson, with her husband Casey Anderson, which became his first number-one single. When the Andersons presented the song to Haggard, they were unaware of his prison stretch. Bonnie Owens, Haggard's backup singer and then-wife, is quoted by music journalist Daniel Cooper in the liner notes to the 1994 retrospective Down Every Road: "I guess I didn't realize how much the experience at San Quentin did to him, 'cause he never talked about it all that much ... I could tell he was in a dark mood ... and I said, 'Is everything okay?' And he said, 'I'm really scared.' And I said, 'Why?' And he said, 'Cause I'm afraid someday I'm gonna be out there ... and there's gonna be ... some prisoner ... in there the same time I was in, stand up—and they're gonna be about the third row down—and say, 'What do you think you're doing, 45200?'" Cooper notes that the news had little effect on Haggard's career: "It's unclear when or where Merle first acknowledged to the public that his prison songs were rooted in personal history, for to his credit, he doesn't seem to have made some big splash announcement. In a May 1967 profile in Music City News, his prison record is never mentioned, but in July 1968, in the very same publication, it's spoken of as if it were common knowledge." The 1967 album Branded Man with The Strangers kicked off an artistically and commercially successful run for Haggard. In 2013, Haggard biographer David Cantwell stated, "The immediate successors to I'm a Lonesome Fugitive—Branded Man in 1967 and, in '68, Sing Me Back Home and The Legend of Bonnie and Clyde—were among the finest albums of their respective years." Haggard's new recordings showcased his band The Strangers, specifically Roy Nichols's Telecaster, Ralph Mooney's steel guitar, and the harmony vocals provided by Bonnie Owens. Producer Ken Nelson took a hands-off approach to producing Haggard. In the episode of American Masters dedicated to him, Haggard remembers: "The producer I had at that time, Ken Nelson, was an exception to the rule. He called me 'Mr. Haggard' and I was a little twenty-four, twenty-five year old punk from Oildale... He gave me complete responsibility. I think if he'd jumped in and said, 'Oh, you can't do that,' it would've destroyed me." In the documentary series Lost Highway, Nelson recalls, "When I first started recording Merle, I became so enamored with his singing that I would forget what else was going on, and I suddenly realized, 'Wait a minute, there's musicians here you've got to worry about!' But his songs—he was a great writer." Towards the end of the decade, Haggard composed several number-one hits, including "Mama Tried," "The Legend of Bonnie and Clyde," "Hungry Eyes," and "Sing Me Back Home." Daniel Cooper calls "Sing Me Back Home" "a ballad that works on so many different levels of the soul it defies one's every attempt to analyze it." In a 1977 interview in Billboard with Bob Eubanks, Haggard reflected, "Even though the crime was brutal and the guy was an incorrigible criminal, it's a feeling you never forget when you see someone you know make that last walk. They bring him through the yard, and there's a guard in front and a guard behind—that's how you know a death prisoner. They brought Rabbit out ... taking him to see the Father, ... prior to his execution. That was a strong picture that was left in my mind." In 1969, Haggard's first tribute LP Same Train, Different Time: A Tribute to Jimmie Rodgers, was also released to acclaim. Between 1981 and 1985, Haggard scored 12 more top-10 country hits, with nine of them reaching number one, including "My Favorite Memory," "Going Where the Lonely Go," "Someday When Things Are Good," and "Natural High." 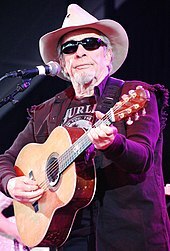 In addition, Haggard recorded two chart-topping duets with George Jones—"Yesterdays' Wine" in 1982—and with Willie Nelson—"Pancho and Lefty" in 1983. 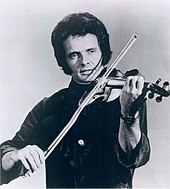 Nelson believed the 1983 Academy Award-winning film Tender Mercies, about the life of fictional singer Mac Sledge, was based on the life of Merle Haggard. Actor Robert Duvall and other filmmakers denied this and claimed the character was based on nobody in particular. Duvall, however, said he was a big fan of Haggard's. Haggard released the duet album Pancho & Lefty with Willie Nelson in 1983, with the title track becoming an enormous hit for the duo. In 1987, a second, less successful LP, Seashores of Old Mexico, was also released, and the pair worked together again with Ray Price in 2007, releasing the album Last of the Breed. In 2015, Haggard and Nelson recorded a video, "It's All Going to Pot," where both are seen singing in a recording studio while smoking joints. The two also recorded another duet album Django and Jimmie. 1984 Best Country Vocal Performance, Male – "That's The Way Love Goes"
1999 Grammy Hall of Fame Award – "Mama Tried"
^ a b c d e Staff. "Merle Haggard (artist page)". Song-Database.com. Song://Database. Retrieved April 7, 2016. ^ a b c "Top BMI Writers, Publishers Honored at 54th Annual Country Awards; Merle Haggard Saluted as BMI Icon". bmi.com. Retrieved September 30, 2010. ^ a b c "Full List of Inductees". Country Music Hall of Fame. April 6, 1937. Archived from the original on March 31, 2013. Retrieved April 16, 2013. ^ a b c "Inductees". Omhof.com. Archived from the original on April 19, 2013. Retrieved April 16, 2013. ^ a b Friskics-Warren, Bill (April 6, 2016). "Merle Haggard, Country Music's Outlaw Hero, Dies at 79". The New York Times. Retrieved April 7, 2016. ^ Merle Haggard's last song released Archived June 11, 2016, at the Wayback Machine, rollingstone.com; accessed August 17, 2016. ^ "Haggard bio". 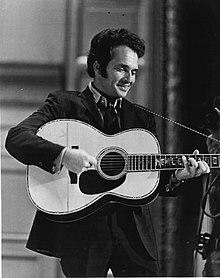 Merlehaggard.com. Archived from the original on June 26, 2015. Retrieved June 2, 2015. ^ a b c "About Merle Haggard". Country Music Television. MTV Networks. Retrieved April 5, 2013. ^ "Merle Haggard". M.facebook.com. April 6, 1937. Retrieved June 2, 2015. ^ "Merle Haggard biography". Biography Channel. A&E Networks. Retrieved April 5, 2013. ^ "A Look at San Quentin". CNN. December 16, 2004. Retrieved April 6, 2016. ^ "Merle Haggard: The Life and Times of a Badass Legend". Rolling Stone. October 21, 2009. Retrieved April 7, 2016. ^ "12 Most Badass Merle Haggard Prison Songs". Rolling Stone. Retrieved April 6, 2016. ^ a b c d Daniel, Cooper (1996). Down Every Road 1962–1994 (Liner notes). 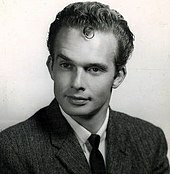 Merle Haggard. Capitol Records. ^ a b c Haggard, Merle (July 21, 2010). "Merle Haggard: Learning to Live With Myself". American Masters. PBS. Retrieved April 7, 2016. ^ Chilton, Martin (April 7, 2016). "Merle Haggard: 'Sometimes I Wish I Hadn't Written Okie from Muskogee'". The Telegraph. London. Retrieved April 7, 2016. ^ a b Kaufman, Will (2009). American Culture in the 1970s. Edinburgh University Press. pp. 115–116. ISBN 9780748621422. ^ a b c d e f g h i j k Staff. "Merle Haggard - Chart History: Hot Country Songs (page 1)". Billboard.com. Billboard. Archived from the original on April 8, 2016. Retrieved April 8, 2016. ^ Staff. "Top 10 Merle Haggard Songs". Tasteofcountry.com. Taste of Country. Archived from the original on January 3, 2016. Retrieved April 7, 2016. ^ McLenan, Andy (October 31, 2003). "Merle Haggard – Branded man". nodepression.com. Retrieved April 6, 2016. ^ a b Bernstein, Jonathan (December 23, 2014). "Flashback: Merle Haggard Reluctantly Unveils 'The Fightin' Side of Me'". Rolling Stone. Retrieved April 7, 2016. ^ Edwards, Joe (November 7, 1985). "Country Music Salutes Old Glory". Chicago Tribune. Retrieved April 7, 2016. ^ Dickinson, Chris (December 19, 2001). "Response to Sept. 11 a Natural for Country Singers". Los Angeles Times. Retrieved April 7, 2016. ^ a b Hicks, Dan (October 26, 1972). "A Tribute to the Best Damn Fiddle Player in the World (Or My Salute to Bob Wills)". Rolling Stone. Retrieved April 7, 2016. ^ a b "Bob Wills Bio". cmt.com. Retrieved April 7, 2016. ^ "TIME magazine cover". content.time.com. TIME. May 6, 1974. Retrieved April 7, 2016. ^ Robert Duvall (actor), Gary Hertz (director) (April 16, 2002). Miracles & Mercies (Documentary). West Hollywood: Blue Underground. Retrieved January 28, 2008. ^ Thanki, Juli (April 6, 2016). "Merle Haggard dead at 79". thetennessean.com. Retrieved April 6, 2016. ^ Schoemer, Karen (July 6, 1990). "Pop/Jazz; A Maverick Upholding Traditional Values". The New York Times. Retrieved October 19, 2012. ^ "Crash (2004)—Soundtracks". imdb.com. Retrieved April 7, 2016. ^ "Merle Haggard—"Big City"". Billings Gazette. Billings, Montana. May 21, 2015. Retrieved April 7, 2016. ^ Owen, Brent (13 April 2016). "Ketch Secor of Old Crow Medicine Show on Merle Haggard, puking in a hotel elevator in Louisville and 'Wagon Wheel'". Leo Weekly. Retrieved 14 April 2016. ^ See, Elena. "First Listen: Merle Haggard, 'I Am What I Am'". www.npr.org. Retrieved July 22, 2010. ^ Greene, Andy (February 9, 2011). "Merle Haggard Reflects On Old Age and God on Leno". Rolling Stone. Retrieved April 6, 2016. ^ Deming, Mark. "Just Between the Two of Us > Review". AllMusic. Retrieved April 7, 2016. ^ Eddy, Chuck; et al. "Merle Haggard: Biography". Rolling Stone. Archived from the original on April 2, 2016. Retrieved April 7, 2016. ^ Menconi, David (December 10, 2014). "Asleep at the Wheel Ready All-Star Bob Wills Tribute With Help From Avetts, Willie Nelson". Rolling Stone. Retrieved April 7, 2016. ^ Shewey, Don (March 3, 1983). "A Taste of Yesterday's Wine". Rolling Stone. Retrieved April 7, 2016. ^ "George Jones And Merle Haggard – Kickin Out The Footlights...Again". nodepression.com. December 31, 2006. Retrieved April 7, 2016. ^ Hudak, Joseph (April 20, 2015). "See Willie Nelson and Merle Haggard Share a Joint in New Video". Rollingstone.com. Retrieved June 2, 2015. ^ "Heart to Heart". allmusic.com. Retrieved April 7, 2016. ^ "Two Old Friends". allmusic.com. Retrieved April 7, 2016. ^ Review Archived September 16, 2016, at the Wayback Machine, AllMusic.com; accessed August 17, 2016. ^ Gretchen Wilson. "Gretchen Wilson: All Jacked Up: Music". Amazon.com. Retrieved June 2, 2015. ^ a b c d e f g h Yahr, Emily (April 6, 2016). "Merle Haggard May Have Hated Modern Country Music, But the Singers Loved Him". The Washington Post. Washington, D.C. Retrieved April 7, 2016. ^ "Watch Willie Nelson And Merle Haggard in The Studio in All-New Footage". Texas Monthly. 2017-06-06. Retrieved 2018-02-27. ^ "The Performers in 'The American Epic Sessions'". WTTW Chicago Public Media - Television and Interactive. 2017-06-06. Retrieved 2018-02-27. ^ "Willie Nelson and the late Merle Haggard - Old Fashioned Love, The Sessions, American Epic, Arena - BBC Four". BBC. Retrieved 2018-02-27. ^ "The Long-Lost, Rebuilt Recording Equipment That First Captured the Sound of America". WIRED. Retrieved 2018-02-27. ^ "'American Epic': Inside Jack White and Friends' New Roots-Music Doc". Rolling Stone. Retrieved 2018-02-27. ^ Swenson, Steve (July 15, 2006). "Haggard's ex-wife dies". Bakersfield Californian. Bakersfield, CA. Retrieved April 6, 2016. ^ a b Chawkins, Steve (April 26, 2006). "Bonnie Owens, 76; Singer and Ex-Wife of 2 Country Stars". Los Angeles Times. Los Angeles, CA. Retrieved April 6, 2016. ^ "Leona Williams Biography". cmt.com. CMT. Retrieved April 6, 2016. ^ a b Fine, Jason (October 1, 2009). "The Fighter: The Life & Times of Merle Haggard". Retrieved April 6, 2016. ^ "Marle Haggard + Theresa Ann Lane—Country's Greatest Love Stories". boots.com. Retrieved April 6, 2016. ^ "Merle Haggard Interview – One on One". Concertlivewire.com. Retrieved July 3, 2013. ^ Crutchmer, Josh (April 7, 2016). "Merle Haggard: An Okie's Recollection". cleveland.com. Retrieved April 7, 2016. ^ "Merle Haggard Bouncing Back: Great American Country". Gactv.com. November 10, 2008. Archived from the original on January 23, 2013. Retrieved June 2, 2015. ^ Dewey, Pamela Starr (May 18, 2015). "White-Washing the Future". meetmythamerica.wordpress.com. Retrieved November 19, 2017. ^ a b Stephen L. Betts (December 6, 2015). "Merle Haggard Hospitalized, Postpones Shows". Rolling Stone.com. Retrieved December 6, 2015. ^ "Merle Haggard Hospitalized, Country Music Legend Forced To Cancel Tour Dates". Inquistr.com. Retrieved March 20, 2016. ^ "Country Music Legend Merle Haggard dies at 79". 23ABC News. Archived from the original on April 6, 2016. Retrieved April 6, 2016. ^ Anderson, Danielle (April 6, 2016). "Merle Haggard's Son Ben: My Dad Predicted He'd Die on 'His Birthday – and He Wasn't Wrong'". People. United States. Archived from the original on April 7, 2016. Retrieved April 7, 2016. ^ Merle Haggard was laid to rest on Saturday Archived April 15, 2016, at the Wayback Machine, hallels.com; accessed August 17, 2016. ^ Price, Robert (April 9, 2016). "Haggard laid to rest in private service". The Bakersfield Californian. Retrieved April 13, 2016. ^ "Merle Haggard to Receive Kennedy Center Honor". Retrieved October 28, 2010. 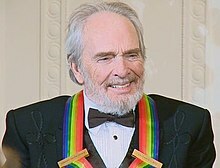 ^ "Merle Haggard Featured in The Kennedy Center Honors on Tuesday". Retrieved October 28, 2010. ^ McLaughlin, Tara (July 26, 2007). "Haggard Gets His Way (Drive)". The Bakersfield Californian. Retrieved April 7, 2016. ^ Self, Jennifer (July 29, 2015). "Home at Last: Emotional Haggard Accompanies Boxcar to Museum". The Bakersfield Californian. Retrieved April 7, 2016. (Subscription required (help)). ^ Brown, Patricia Leigh (February 26, 2014). "For Merle Haggard, a Boxcar Was Home. Now It Needs Work". The New York Times. Retrieved April 7, 2016. ^ "Long Time Gone by Dixie Chicks Songfacts". songfacts.com. Retrieved April 7, 2016. ^ "I'm a Truck > Lyrics". metrolyrics.com. Retrieved April 7, 2016. ^ "Shooter Jennings—Put the O Back in Country > Lyrics". metrolyrics.com. Retrieved April 7, 2016. ^ "Hank Williams III—Country Heroes > Lyrics". metrolyrics.com. Retrieved April 7, 2016. ^ "David Allan Coe—You Never Even Call Me by My Name > Lyrics". metrolyrics.com. Retrieved April 7, 2016. ^ "George Jones—Who's Gonna Fill Their Shoes > Lyrics". metrolyrics.com. Retrieved April 7, 2016. ^ Totty, Seward. "Lexington Lab Band Take the Stage at the Lyric Theatre". Hamburg Journal. Archived from the original on April 22, 2016. Retrieved April 8, 2016. ^ Martin, Tom. "Local Music: These Lexington Musicians Take It to the Lab". Tops Lexington. Top Marketing Group. Retrieved April 8, 2016. ^ Staff. "Mama Tried". deaddisc.com. The Grateful Dead Family Discography. Archived from the original on March 28, 2016. Retrieved April 7, 2016. ^ Staff. "Sing Me Back Home". deaddisc.com. The Grateful Dead Family Discography. Archived from the original on March 28, 2016. Retrieved April 7, 2016. ^ a b c d e f g h i j Staff. "Merle Haggard - Chart History: Hot Country Songs (page 2)". Billboard.com. Billboard. Archived from the original on April 8, 2016. Retrieved April 8, 2016. ^ a b c d e f g h i j Staff. "Merle Haggard - Chart History: Hot Country Songs (page 3)". Billboard.com. Billboard. Archived from the original on April 8, 2016. Retrieved April 8, 2016. ^ a b c Staff. "Merle Haggard - Chart History: Hot Country Songs (page 4)". Billboard.com. Billboard. Archived from the original on April 8, 2016. Retrieved April 8, 2016. ^ "Awards: Winners Search Results: Merle Haggard". ACMcountry.com. Academy of Country Music. Retrieved April 8, 2016. "If We Make It Through December "